As anyone that follows my reviews knows, I'm a sucker for great cover art. So, when I stumbled upon Mavara's latest album, I had to hear it as the cover art is some of the most unique and hauntingly beautiful art I've seen of late. Fortunately, the music holds up to the excellence of the art, and they fit together quite nicely. 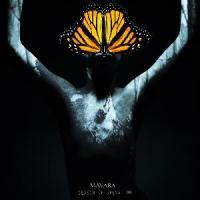 Mavara is a band from Iran that fits well into the crossover prog genre. They certainly have a foundation of neo-prog, but they also feature a hefty portion of dark post rock and also heavy prog. "Season of Salvation" never rests on its laurels: It is quite impressive in structure, style, and overall atmosphere, too. The one word that comes to mind when I hear this album is "lush". The album feels so whole, and it even seems to pull off a sort of oceanic vibe, though I'm not sure how in so many words. This is no technical album, as the expertise is shown more in excellent structure ("Period of Innocence") and dark, soothing ambiance ("Endless Illusion"). There is a certain amount of maturity here that is apparent throughout the entire album. "Season of Salvation" has many strong points. For instance, the vocalist has a unique voice that perfectly fits the musical style presented. I'm not sure why, but the vocalist reminds me of Jim Grey from Arcane and Caligula's Horse, though with a deeper and darker tint. The vocals are often sublime, though there are a few weak spots. Another strength of this album is the keyboard work. The overall feel of the synth is either haunting or that of light cutting through dense darkness, so the album has a very mature tone to it. The soaring and falling of the layered textures elates and deflates our emotions staggeringly well. In my opinion, that is one sign of a fantastic album. The rest of the instrumentation is quite adept. These guys (and gal) impress whether they are focusing on ambiance or on a great jam, though they do far more of the former. This is definitely a moody, emotionally raw album first and foremost. Indeed, this album seems to be a cry for meaning and peace in a sea of questions, mysteries, and possibilities. This theme lends itself to emotional music, and I feel Mavara has nailed that. This album is very strong, and I thank the band for providing a copy for my review.